So…I know, it’s been a while. Like, 7 months, a while. Life got in the way, etc etc. Also, there wasn’t anything too terribly exciting going on with the bees, just getting them ready for winter. But that’s enough about that, let’s get on with filling in the last 7 months! Last we left off we had just completed our first honey harvest! Oh how sweet it was! After the July honey harvest, we left the bees more to themselves. We let them keep the rest of the honey as we made our inevitable descent into Autumn (I’m not a fan, can you tell?). We treated our bees to prevent Nosema…Imagine thousands of bees with dysentery, stuck inside a small hive with nowhere to fly. It’s pretty nasty, and can be a bee-killer as it will weaken the hive over the winter often to the point that the hive can no longer support itself and dies out. Winter Dead Outs. In recent winters, it has become more and more a beekeepers worst nightmare. There’s no one cause for a hive to not make it through the winter. Aside from all the many many types of pests and diseases that can weaken a colony, like Nosema, there are several other factors. 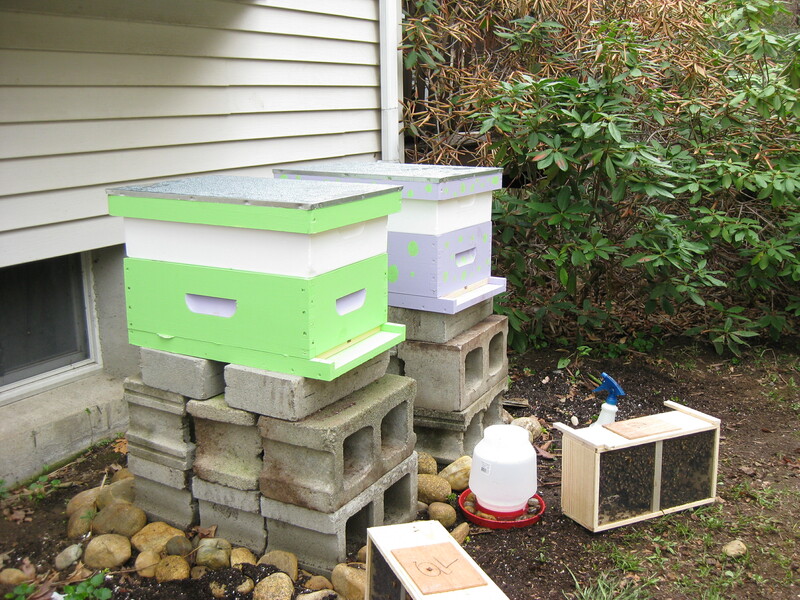 Not prepping the hive with proper ventilation in time for winter can cause moisture build-up on the inside cover of the hive. Cold, wet bees are not happy or healthy bees and do not last long. Ventilation is key. The next two issues are actually brought on mostly by the extremely mild winter we’ve had here in Boston. It has been lovely for us humans, but has wrecked havoc on the bees’ poor internal seasonal clock. Both hives tried to swarm in September. That would have been a suicide mission for them, but thankfully we managed to avoid it with some good advice and lots of luck. When a hive swarms, it takes 1/2 to 2/3 of the mature, working bees as well as the queen, and flies off to a new place to make a new hive. The swarm takes much of the honey stores, and bee bodies necessary to keep a hive warm in the winter months. Not enough bees means they can’t cluster for warmth. That means death. There were many beekeepers in our area who unfortunately were unable to prevent these very late-season suicide missions. These swarms most often are in May/June and give both the swarm and the hive left behind time to build up population and stores before winter. Warm fall=above average number of swarms. Next problem with mild winters: Starvation. Each of our hives went into the fall with 80 pounds of honey! Generally, a queen stops laying eggs in Oct/Nov and the bees cluster (and consume little food) until Feb/March when the queen resumes laying. Normally, 80 pounds would be considered conservative for winter honey stores around Boston, but this winter wasn’t normal. We believe our queen laid eggs well into December (if she even stopped then!) and has definitely started laying as of early-mid February. In addition, with 60% of this winter having daily temperatures over 45 degrees, that was 60% more time our bees were NOT in cluster, consuming less food. They were up and flying around, and we saw them flying around quite often in December, January, and February. They were out and about just two days ago! So, far more activity means more consumption. We started feeding our bees (homemade fondant) 3 weeks ago because they would have starved otherwise. For other beekeepers in the area who were less conservative with honey stores, they’ve had starvation problems. Putting all this death and gloom aside, our bees are still alive (knock on wood)! We’ve seen quite a bit of them, and they appear to be happy and healthy. They continue to eat the fondant at a good pace, which means the queen may already be laying eggs. Since our hives appear to be very strong (we’ll have a better idea when we get to inspect the hives in April), we plan on splitting them in the Spring. As they will likely try and swarm come Springtime, we are doing a sort of ‘controlled’ swarm for them, by taking the queen and some of the bees and putting them into a new hive. 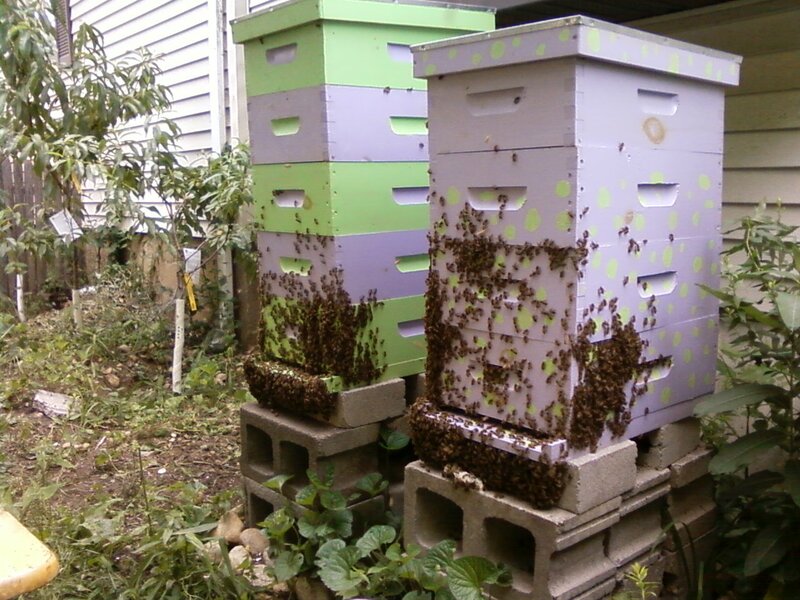 They feel less crowded and don’t need to swarm, and we get more (free) hives! If all goes well, we will have four hives this year! Honey honey honey!! So now the preparation has begun again. We ordered more woodenware for the two new hives and must assemble and paint. I won’t make you sit through that boring process, so instead, here are some lovely pictures I took last August/September! It’s been quite some time since I last posted, but that is because there has not been much to report. 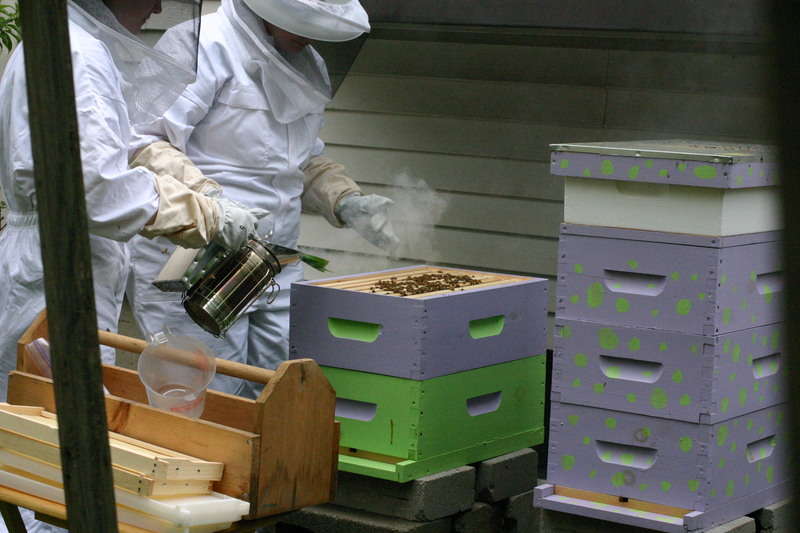 Mine and my mother’s hives have been what honey bees do best–be busy and make honey. We have been extremely lucky thus far. We have heard so many horror stories of first year hives succumbing to the (almost) inevitable swarming in the Spring, not long after establishment. 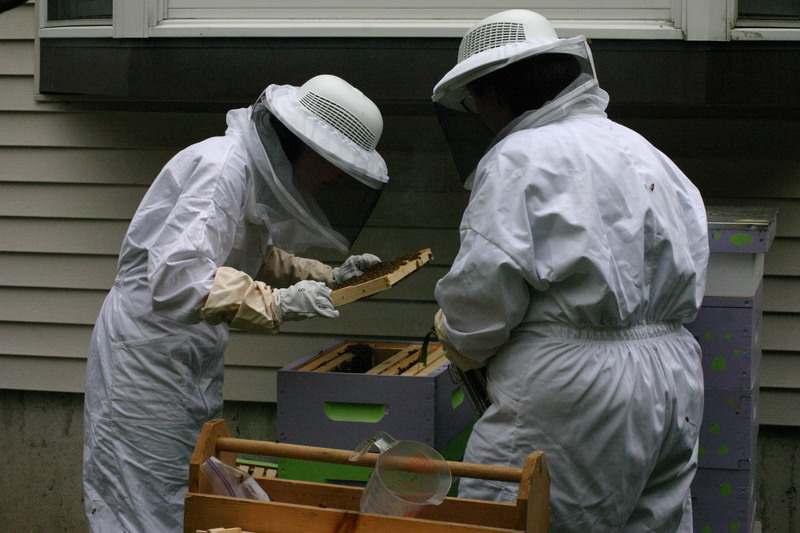 Many first year hives this year have also been plagued with queen issues–the queen that came with the original package was superceded, which interrupts the brood process by several weeks. Somehow, with a bit of luck, our hives have avoided such issues (knock on wood) and have been busy making babies and honey. There is constantly a swarm of new bees taking orientation flights and older bees zipping in and out with goods from the field. 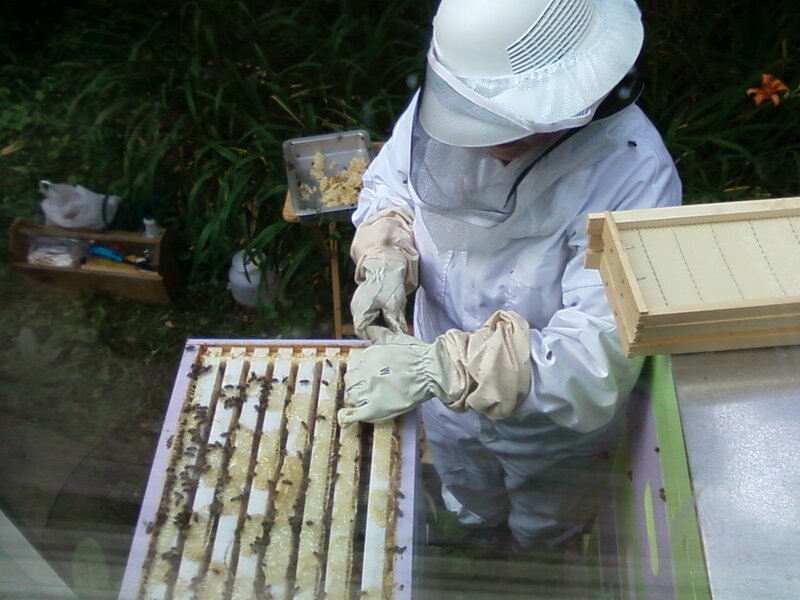 Three weeks ago, the previous hive inspection we performed, my mother and I were a bit overwhelmed by all the burr-comb and honey and sticky mess in our hives. We took too long cleaning house and the bees got agitated so we couldn’t finish. So, we invited our fantastic bee teacher over to show us some tips and tricks and offer insight as to how our hives are doing. As soon as we pried the top off of my hive this week, he said my hive was honey-bound, had no room, and we needed to remove some honey ASAP. Well, that was just music to my ears! I haven’t stopped smiling since! We removed 5 frames (about 20LBS) from my hive. We could have taken more, but not surprisingly, the bees got quite agitated. We didn’t have time to go into my mother’s hive that night, but with the great tips and tricks our teacher showed us, my mother had enough confidence to inspect her hive solo (my father supervised from the safety of the window, so she wasn’t completely alone with the agitated bees!) 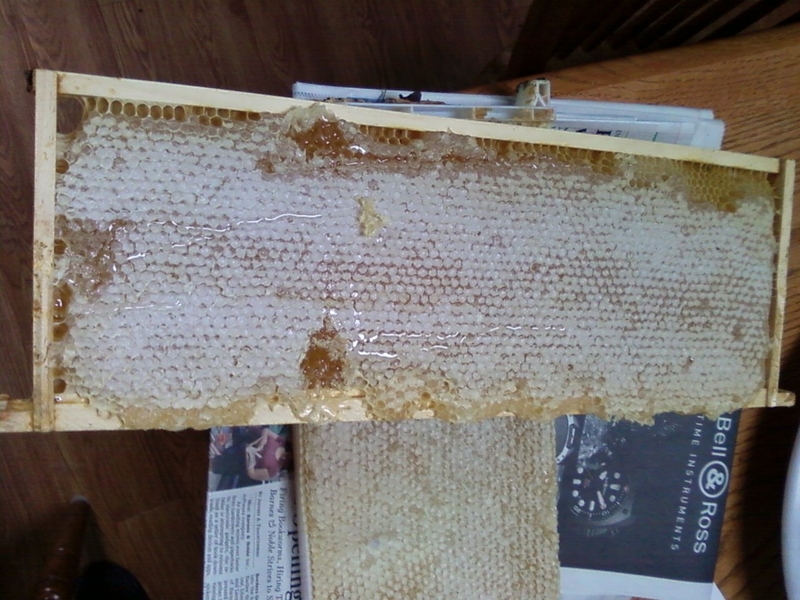 She managed to get two bulging frames of honey, which add about 10 LBS to our total. Right now, we are waiting for the chance to extract and bottle the honey, which will hopefully take place next week! I will most definitely take pictures of the extraction and bottling process, so look out for that! It’s been quite a while since my last post, and I have a few more pictures to share. Since my last post, my mother and I have done several more inspections. We generally do them once a week, weather depending, since we can’t open the hive if it is raining or too cold. Things are going very well so far with the bees! 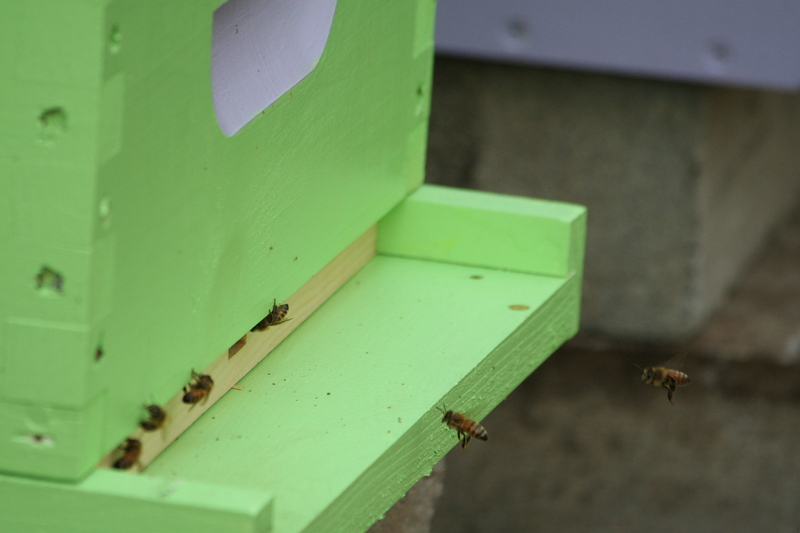 Every inspection has been successful in its own way, and we have learned more with every visit to the hive. Currently, our hives now have 4 boxes. 3 are for brood and the bees personal honey stores. Anything past the third brood box is ‘extra’ and can be harvested by the beekeeper as long as the bees will have enough for winter. Unfortunately, first year hives generally do not produce enough honey for the beekeeper to share in the spoils! Alas, we are still having a lot of fun learning about our girls! In addition to now having 4 boxes on each hive, we have removed the entrance reducers entirely and will be taking the feeders off this week. Also, the ‘weak’ hive that we were worried about because its progress was much slower than the other is now flourishing and holding its own! As always, I will try to get more pictures, but we’ve discovered it’s not easy trying to get them while inspecting a hive! So Sunday was another big day in our young beekeeping careers! My mother and I did our first full inspection of the hive. We had to wait almost 2 weeks since we installed the bees to do this, which was killer! After installing the bees, you must do absolutely everything in your power not to disturb the bees for the first week, or they may kill the queen. The worker bees will likely blame any disturbance on the queen that they are only just getting acquainted to and kill her. Not the brightest thing to do, but it happens. So, we already knew before the inspection that the queens had been released, thanks to our quick peak in the hive the previous Sunday. Our mission for the first inspection was to establish whether or not the queen was alive and laying eggs by looking for new eggs and capped brood (larvae). Now, in our beekeeping class, our teacher had urged us not to look too hard for the queen because she is hard to spot and it can be a waste of time. As long as you see eggs, she’s been around recently. Thankfully for my mother and I, we were lucky enough to see the queen in both hives! We were so lucky. In addition to seeing the queens, both hives are doing very well. 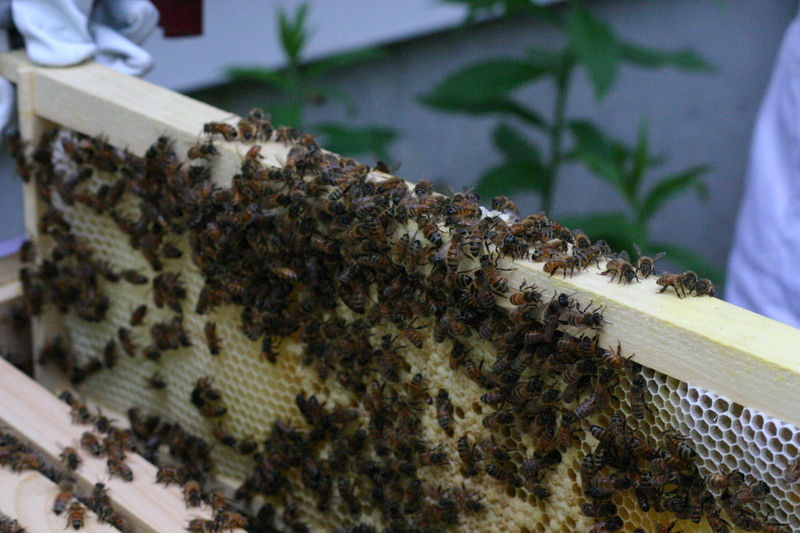 For equipment, we are using 8-frame medium supers, and 7 to 8 frames had drawn out comb in each hive. 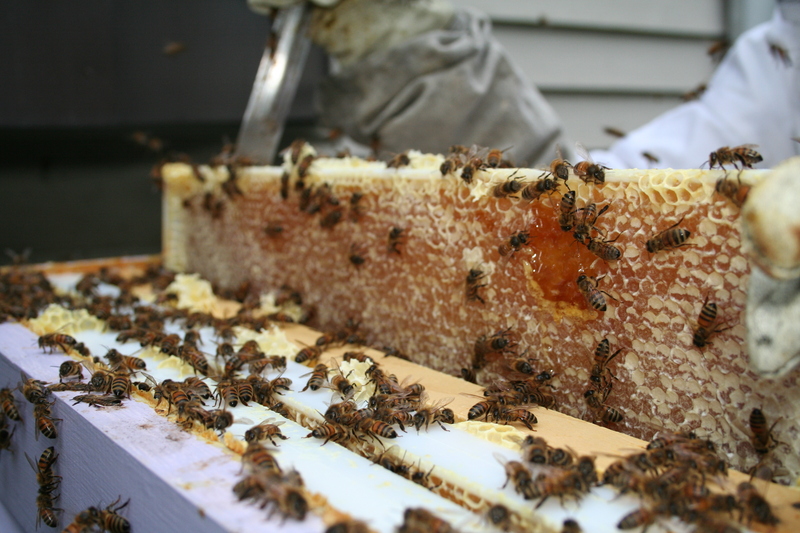 Drawing out comb on foundation is essential because the hexagonal comb is where bees store food (honey), nectar, pollen, and grow young bees. Because all the comb was drawn out, we got to add a second super, doubling the size of the hive. 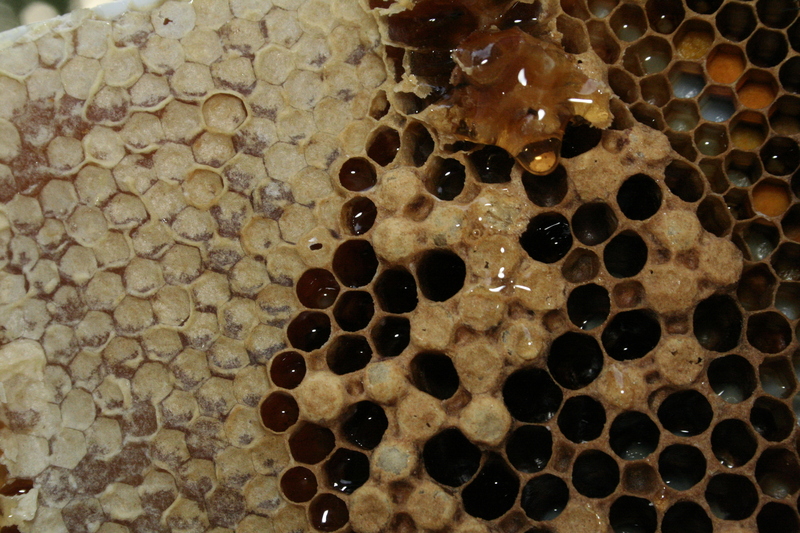 It was amazing to look at the inside of a working hive. While I am somewhat afraid of bees and get very uncomfortable when they buzz near my head, I completely forgot to be afraid while I was looking at the frames in my hive. 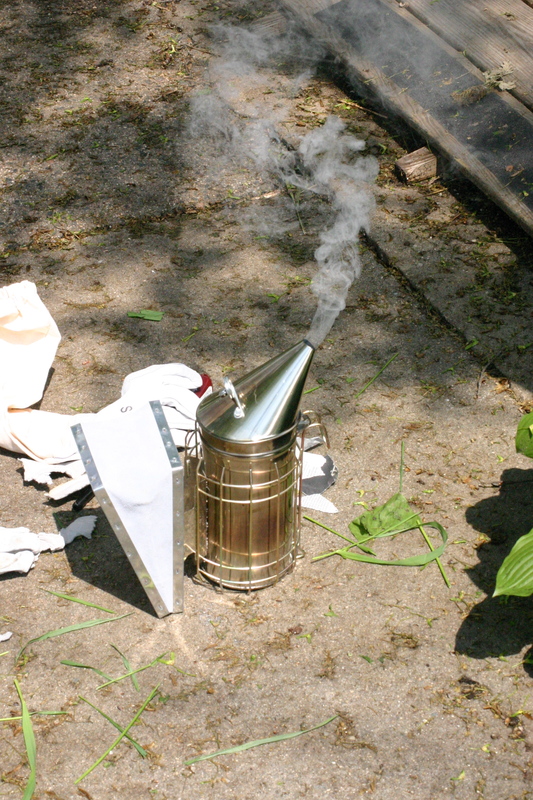 It wasn’t until I was on smoker-duty, while my mother looked at her hive, that I remembered bees make me uncomfortable. 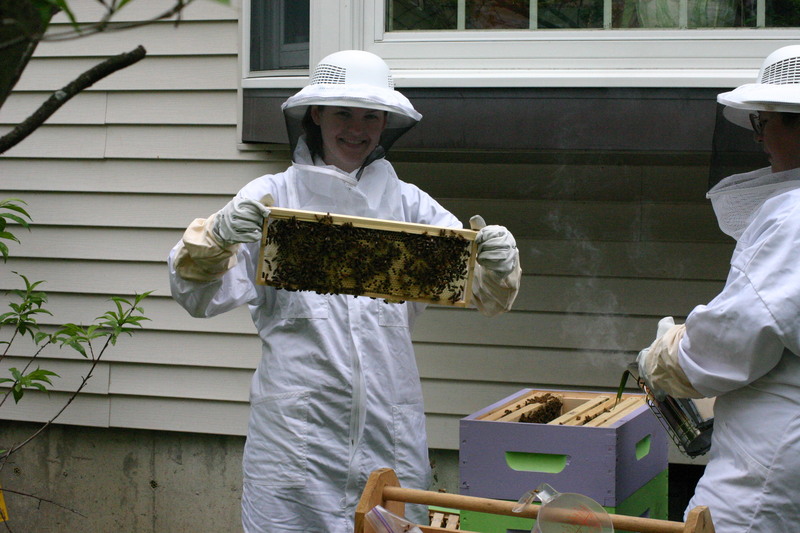 I couldn’t believe how at ease I was when I was inspecting my hive. So, all in all, it was a very successful trip into the hives. We managed to light the smoker (essential for calming the bees), see the queens, add on a super to each hive, and see the inner workings of our hives. I also took a big step in getting over my fear of bees. Next time I do an inspection, I promise to take pictures of the inside of our hives. So the day has finally arrived! My mother and I drove up to NH to pick up our bees on Tuesday, 4/26. The apiary we ordered the bees from was in a surprisingly residential area. The apiary was run out of someone’s driveway/garage. We paid for the bees in the garage and picked up our 2 bee packages (two of hundreds) in the driveway. We loaded the bee packages into the back of the car and drove home. Even though there were several homeless honey bees clinging to the outside of the packages (probably since they were loaded in Georgia), there were no problems with loose bees flying around the car. These loose bees are referred to as hobos. When we got back to the house, we gathered all of our supplies near the beehives and got to work pouring the bees into the hives. Someone recently told my mother and I that there is no such thing as ‘mistakes’ when it comes to beekeeping, only ‘learning experiences’. Well, we had quite a few of those. We dumped the bees in, as you can see in the video. The first minute of the video (which you can totally skip, no hard feelings) is just of my mother and I prying the top off of the package and taking out the can of food. What you don’t see in the video is my mother and I installing the queen cages into the hives before dumping the bees. This is the most crucial part of getting a hive established. If the queen is not installed correctly, it could lead directly or indirectly to her death. See, honey bees are very fickle. If anything goes wrong, or the bees feel disturbed in any way, they will likely blame it on the queen and kill her. That would be very bad! 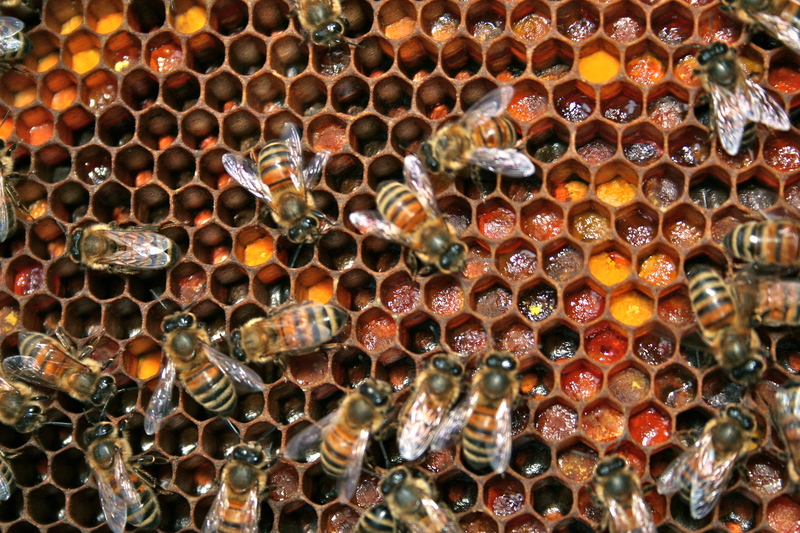 While its possible to get another queen, it delays the hives’ production of new bees. Without a constant supply of new bees, honey production will be severely interrupted. So, our queens are released. For our first venture into the hive (today), we were not supposed to do anything other than make sure the queen was released and take out the cage. We did not look for new eggs or anything, as we wanted to disrupt the bees as little as possible (Ha, yeah right). So hopefully the released queen decided to hang around and lay eggs! 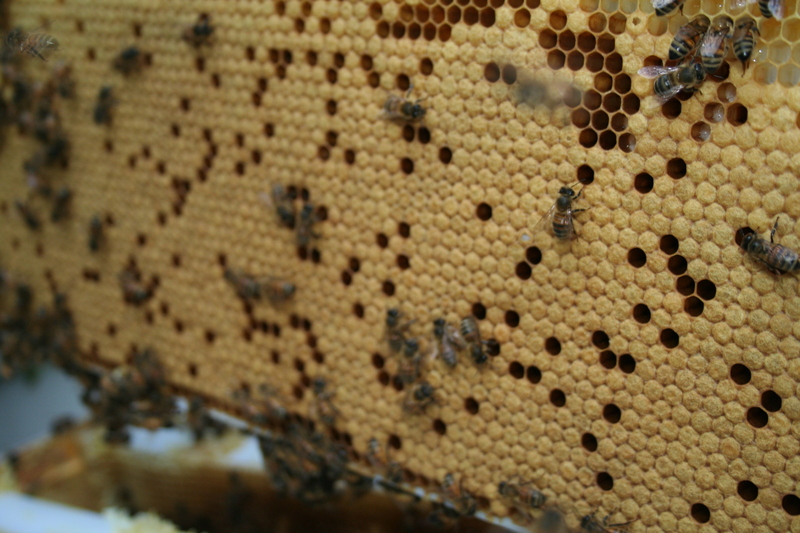 In other news, the bees were very busy drawing comb, which is exactly what we want to see! My mother and I were a little nervous about the state of my mother’s hive, because right from he get-go it seemed less active than mine, but they both seem to be doing well! Next up, the first full inspection! Hopefully next weekend, weather depending. So, we’re T-minus 7 days from the Big Day, and I am starting to get nervous. My mother and I still have some prepping to do and I suddenly feel like we’re out of time (even though we have all week. Deep breath, relax…) We still need to get our hives all set up outside on their cinder-block stands and create a good water bowl for the bees. We still have a few frames to put foundation in, and we still need to try out the smoker. Now that I’ve written out that list, it doesn’t seem so bad. We’ve already painted the hives and assembled 50 frames and put foundation in about 40 of them. Since our neighbors and friends already think we’re crazy, my mother and I decided to go a little crazy with painting the hives (see photo). Hopefully we look properly insane now. I wouldn’t want to disappoint. It’s too bad the bee suit has to stay white-I would definitely tie dye it, or something equally wacky. This week I will be pouring over my notes from the bee class I took…It seems so long ago, but it really only ended last month. 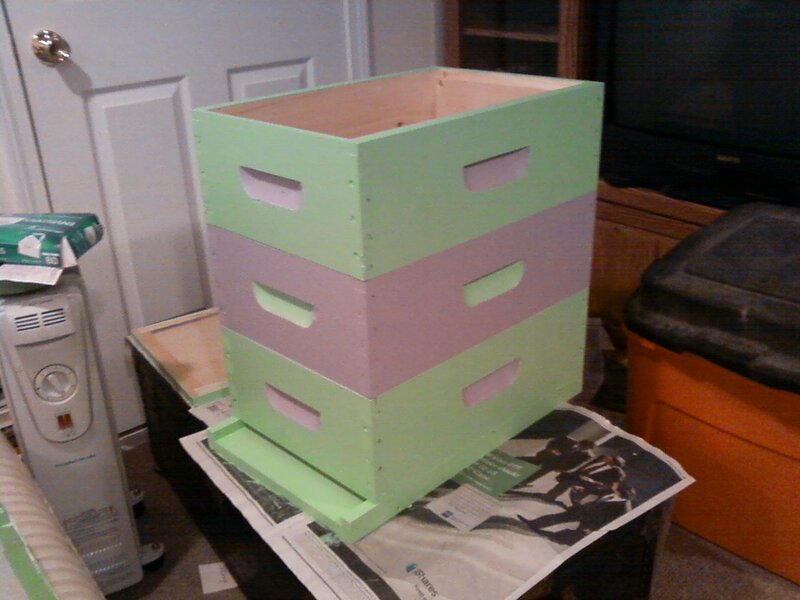 Unfortunately the weather has not cooperated so far this Spring, so our teacher has not had his official Spring ‘hive opening’-which would allow my mother and I to actually get close to a working hive and get acquainted with the idea that this is what we’ll be doing…So, we’re going into this a little blind, but that’s OK. Experienced beekeepers are all very friendly and supportive of new beekeepers, and I know that help is only a phone call away. It’s very interesting, now that I have become somewhat immersed in the ‘beekeeping world’, beekeeping is kind of like being a part of a secret society; You don’t know it until you become one, but there are beekeepers everywhere! Now when my mother or I mention to someone that we keep bees (or will be soon), that someone always seems to know someone else who also keeps bees! I have had many stories like this so far, and I’ve only been talking about beekeeping for a couple of months.Hopefully I can enlist a brave soul to take photos or video of my mom and I on Game Day. I have a feeling it will make for great entertainment.